NOTE: INDIVIDUAL RESULTS MAY VARY! It is a skin condition that manifests as loss of pigment in the skin – white spots. These white spots are a loss of pigmentation cells and can affect any area of the body. Usually develops on the face, arms, legs, and groin area. Vitiligo can affect anyone of any age. It is thought to be an autoimmune process meaning that the body makes antibodies to its own pigment cells which result in the destruction of those cells. Vitiligo patches typically appear milky white and can enlarge over time. It is rare for white patches to return to normal skin color on their own. Each case is different and the severity of pigment loss can differ from person to person. Light skinned people typically notice these patches more when they are tanned in the summer. There is no way to predict how much of the body it will affect. There are several treatment options, but no treatment can guarantee re-pigmentation. 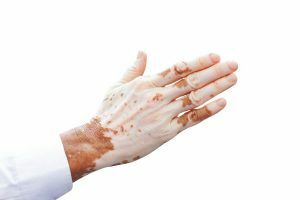 There are also options to disguise vitiligo spots with makeup or self-tanning dyes. The dermatology professionals at Kentucky Dermatology can discuss the most appropriate treatment options for your skin condition. We treat this condition in our Lexington, London, and Richmond office. Call us today and schedule an appointment. We are an office of local skincare experts who have a variety of specialties, including dermatology and cosmetic areas, including loposuction, diVa vaginal rejuvenation, Halo laser therapy, RF Varicose Vein procedures, and more. We are located in Lexington, Kentucky (KY), but we also proudly serve the greater Lexington area, including Richmond and London. NOTE: INDIVIDUAL RESULTS FROM COSMETIC OR DERMATOLOGICAL SERVICES MAY VARY! ©2019 Kentucky Dermatology and Cosmetic Specialists. All Rights Reserved.